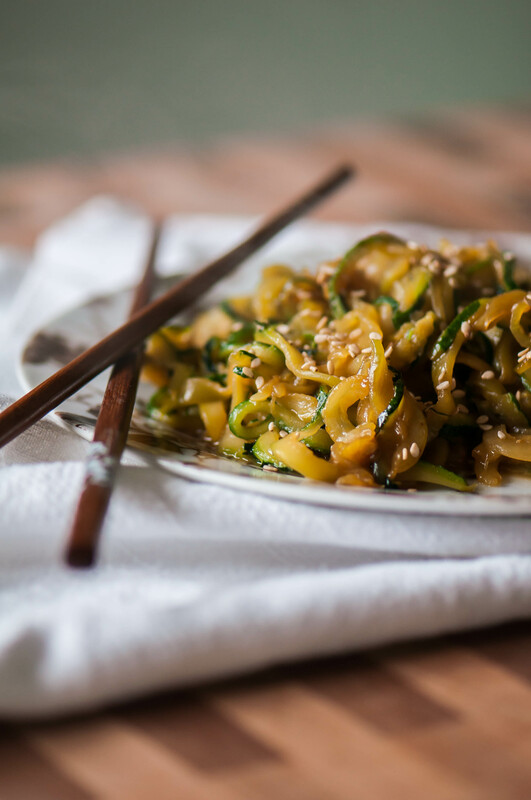 It’s time to make eating your veggies fun and I did it with these Stir Fried Zoodles. With this fun spin, you can make at a restaurant favorite at home for a portion of the price. If you’ve been a follower for awhile I’m sure you can tell that we love Asian food around here. I mean, I shared a recipe just last week and here I am doing it again. My kids love any and all Asian sauces and therefore will eat anything covered in them. So that means Asian cuisines go down often. We absolutely love going to hibachi-style restaurants but they are pretty pricey so it’s a special occasion kind of thing for us. When we were craving some Japanese flavor recently I decided to take a swing at making our favorites at home (hibachi chicken is coming next month friends). We all have a different favorite when it comes to the protein but our favorite hibachi vegetable is hands down the zucchini. At our favorite spot, they cut it into thick matchsticks but since we are currently obsessed with our spiralizer I decided to turn the zucchini into zoodles instead. Plus, I figured I would have a better chance of the kids eating it. It was a good decision my friends. There was more surface area for the zucchini to get golden brown and caramelized and because the zucchini is cut so thinly it cooks incredibly fast. Double win. And the preparation really couldn’t get simpler. Preheat your wok or skillet. Spiralize the zucchini. Stir fry with a little olive oil and soy sauce. Sprinkle with sesame seeds. Done. See what I mean. Probably 10 minutes tops from start to finish for a healthy and tasty side dish. And now that it’s almost zucchini season, I forsee this happening often. I’ll be sharing another new zucchini favorite in a few weeks too so keep an eye out for that. Heat a skillet or wok over medium-high heat. Add olive oil and zucchini. Stir fry until softened and slightly browned, 2 to 3 minutes. Add soy sauce and sesame oil and cook another minute, until soy sauce thickens and coats zucchini. Sprinkle with sesame seeds. I see lots of recipes for zoodles around lately but this one caught my attention because it is incorporated in an Asian dish! You gave me a light bulb moment as my daughter never eats her veggies, turning them to noodle form might change her mind. I hope it tricks her into eating her veggies! It helped slightly with my picky 6 year old.